If you are in any artist groups, have you noticed that each one seems to be having a challenge of some sort or some exhibit or another that you need a create a piece for? Seems like so many more than before. I've always thought if you join a group one should participate otherwise why be a member. Since I really like all the groups I am in, I have been quite busy. Just within the last few days, I have sent in photos of recent pieces to three exhibits and I just finished a small fun piece for the challenge of the Southern California Handweavers group. Here's my challenge piece after playing with the image in my new CS5 package. For this challenge we were to be inspired by a quote about color...mine quote was by Jules Fieffer, who said artists can color the sky red because they know it is blue. Those of us who aren't artists must color things the way they really are or people might think we are stupid. 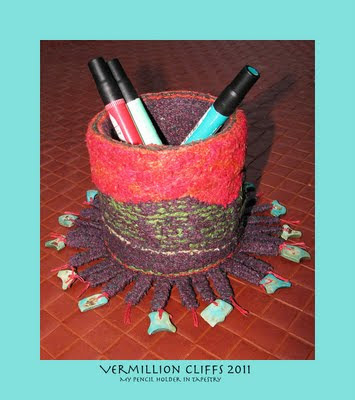 I've always wanted to make a pencil holder for my studio...while on a trip to the North Rim & Bryce I took a photo of the cliffs from the Navajo Bridge... I had an empty loom...some leftover yarn...everything came together in the end. Life works that way sometimes.